Almost every person of Earth detests even the thought of washing the dishes or doing the laundry. We usually leave this task to our mothers or wives, but you just need to start doing them at some point in life. Therefore, the newest discovery of the Chinese students is a solution to this problematic issue! Namely, it will help you do this task and at the same time, exercise! Namely, this discovery promotes multitasking, as it helps you clean your clothes while exercising, and at the same time, it saves on water. 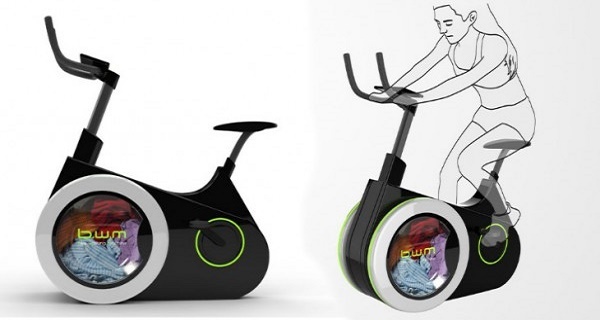 This machine is named BiWa, or, The Bike Washing Machine, and it is a static bike with installed door, drum, and dispenser and runs on human power. You should rotate the pedals above the clothing drum, and thus, you will efficiently clean them. Moreover, if you ride it a little bit stronger, a small display screen will be turned on, which will indicate the needed amount of exercise in order to finish with the washing of the clothes. And the best thing about it all is that you can turn it around and use its stored energy again. Namely, the extra energy is preserved for a subsequent usage, and some member of your family can get the daily workout. This incredible invention is still not sold on the market, but it has intrigued a growing number of people even now, as it actually solves the problem of a lack of time, as now, you can actually succeed to get all things done! You will be healthier and fit and you will avoid the mess of dirty clothes in your home! Furthermore, you will save a lot of money and energy!